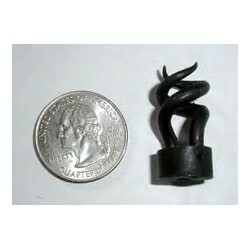 The tow worm is used for cleaning your musket in the 18th style. The worm is threaded so you can attach the worm to the end of your steel ramrod. You can use tow to make a ball on the end of the worm to clean the barrel. You can also use the worm to retrieve a lost patch in the bottom of the barrel. The worm is made of steel and threaded with female 5 mm or we can run a tap for 10/32 threads. The worm measures 1" tall and about 1/2" round. This will work well for a 62. caliber and up.